With a service territory that covers five states and a subcontractor network serving the rest of the U.S., Federal Heath Visual Communications relies on a fleet of Elliott Equipment Company trucks to keep lights and signs for some of the biggest consumer brands in the country in good working order. Federal Heath uses the following equipment to position workers for elevated repair or maintenance jobs and for installation of elevated lights and signs. L60R HiReach – With a working height of 63 feet, side reach of 56 feet, a main winch capacity of 5,900 pounds and a jib winch that can lift 500 pounds, the L60R features a 40-by-60-inch EZR removable work platform. G85R HiReach – The G85R HiReach features a working height of 87 feet, a side reach of 61 feet, and main winch, jib winch and platform similar to the L60R. M85 HiReach – The M85 HiReach’s end-hung, 30-by-54-inch platform has a 750-pound capacity and features a jib winch that can lift 500 pounds. This machine has a working height of 87 feet and a side reach of 74 feet. Federal Heath first began replacing its fleet with Elliott HiReach aerial work platforms over two decades ago and realized immediate benefits from doing so. 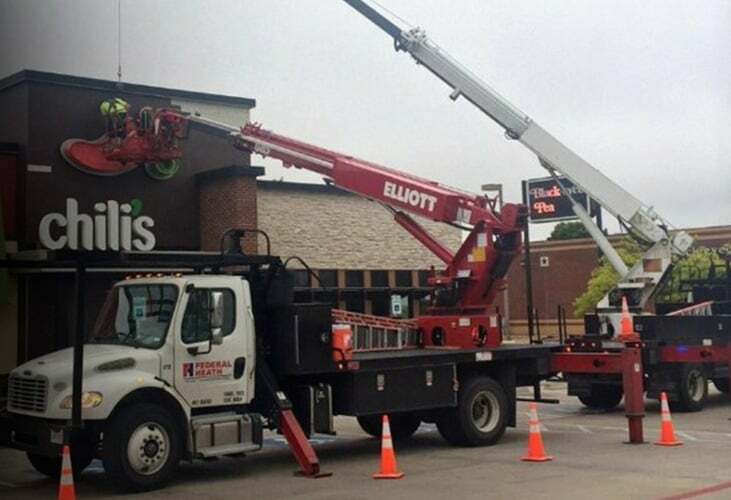 Elliott Equipment Company was the first in the sign industry to offer aerial lifts equipped with remote controls in the work platform. That configuration allows a single worker to lift him or herself up in the platform rather than needing a second worker to operate the lift from ground-level controls. In addition, Elliott pioneered the concept of main boom material handling on an aerial device. The ambition of these allowed Federal Heath to reduce their fleet and simultaneously improve their worker productivity and efficiency. This immediately slashed Federal Heath’s labor costs, making them more competitive in the market. In the two decades Federal Heath has relied on Elliott HiReach sign trucks, their workers have enjoyed easier access to signs and lighting. This had previously been a challenge when Federal Heath’s fleet contained older, bigger trucks that were harder to maneuver into position. Working in confined spaces posed safety risks and caused project timelines to increase. In addition, some of Federal Heath’s clients had small parking lots that were inaccessible to customers when the large lift truck was on-site. Elliott Equipment Company’s HiReach aerial lifts are designed to allow for short jacking for narrow setups in a compact footprint. Elliott’s “office in the sky” accessory package, including 110V, welding, air, oxy/acetylene and jib winch complete the package, giving Federal Heath’s operators everything they need to do their job right at their fingertips. Federal Heath has trusted Elliott Equipment Company to continually provide quality equipment for a wide variety of jobs for over 20 years. Download our brochure to see a full list of Elliott models designed for the sign and lighting industry and to learn more about the benefits and features you’ll only find with Elliott Equipment Company products.